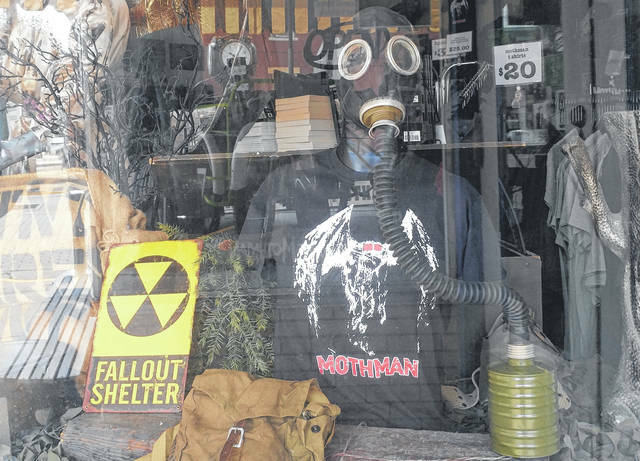 The Mothman Museum has recently changed out some of its store decor to fit the theme of the Fallout 76 video game which is anticipated to launch in November. POINT PLEASANT, W.Va. — With the announcement that the internationally-known gaming franchise Fallout would be basing its next title, Fallout 76, in West Virginia and that Mason County’s Mothman legend would reportedly be featured in the game, the Mothman Museum reached out to Bethesda Game Studios and asked them to participate in this weekend’s upcoming festival. Wamsley said festival organizers weren’t sure of what to expect but were pleasantly surprised by Bethesda’s reaction. The museum and festival organizers were put in contact with Bethesda’s marketing department and Wamsley said they seemed “excited” to take part in the event. Wamsley said details were still partly being worked out. Wamsley said Bethesda had been “super approachable” throughout the process of getting the festival organized with the company’s presence. Wamsley said posts made on social media connecting Mothman and Point Pleasant with the Fallout 76 game had garnered thousands of likes.